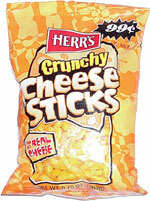 Taste test: These taste very close to crunchy Cheetos, although they are longer and thinner, with less cheese powder. Still, that's kind of a good thing, as the orange residue on your hands is less, and you have a chance to savor the crunch instead of being overpowered by cheese. Good overall taste. Smell test: Kind of cheesy, also kind of chemical-ly. From the package: Contains 150 calories for each serving (serving size 1 oz.). 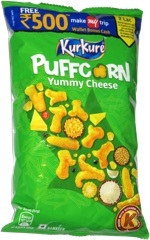 This snack was discovered by Jeremy at Salisbury Beach, Massachusetts. Review published .